Written and filmed September, 1930. Released by MGM, November, 1930. Produced by Hal Roach. Directed by James Parrott. Three reels. Cast: Stan Laurel, Oliver Hardy, Thelma Todd, James Finlayson, Charles Gerrard. STORY: On the run from the law, Stan and Ollie take refuge in the temporarily deserted mansion of Colonel Buckshot. A couple arrives wishing to rent the mansion for the summer, so Ollie poses as the owner, Stan doubles as both butler and maid. The real Colonel Buckshot returns home armed with shotgun, and the boys escape atop a tandem bicycle, dressed as a water buffalo. A remake of Duck Soup, which, in turn, was an adaptation of a vaudeville sketch written by Stan's father. As most fans know, the title is a misquote of Ollie's famous catchphrase "Well, here's another nice mess you've gotten me into. JL: Time has not been kind to this film. This is not to say that Another Fine Mess is any more dated than it was, say, 40 years ago, but rather that its appeal tends to diminish with repeated viewings. As we mention often throughout this site, one of the remarkable qualities that has kept Laurel & Hardy fresh and funny after 70 years is that their best films are just as hilarious whether you've seen them once or 300 times. Even though we know the gags before they occur, we can still appreciate the timing of a pratfall, the subtle inflection of a line delivery, or the staging of a bit of comic business -- the sort of things that almost require repeated viewings, in other words. But Another Fine Mess is one of L&H's rare situation comedies, in which the comedy stems from the situation rather than individual gags. On that level, it's a fine film that's enormously entertaining for first-time viewers. But it's the gags that make for the most memorable moments in L&H films: the mule on the roof, Ollie dragged down a flight of stairs by a runaway piano, a pepper shaker and a bowl of soup, Ollie mistaking a stick of butter for a cake of soap, and so forth. That there are no such moments in Another Fine Mess does not make it a lesser film, but it does make it a less enduring one. What is perhaps the best-known scene in the film illustrates this point. Stan, in maid's drag, shares a few moments of "girl talk" with Thelma Todd. The performances lend the scene a lasting charm, but the ad-libbed nature of the dialogue wears thin after a while. Improvised comedy is funny upon first viewing, in part because we are impressed by the performers' confidence and quick wit. But lines such as "Imagine a house without bedrooms -- isn't that silly?" elicit fewer laughs upon each viewing, so that whatever appeal the scene retains depends not on what they do, but on the way they do it. The same holds true for the rest of the film, in that there are only so many times we can laugh at Ollie's inability to find that billiard room or remember Lord Plumtree's name. Ollie himself remains delightful; what he is given to do, less so. The film is also marked by a pace and energy level more tepid that what the material would seem to demand. A premise of hiding out in a strange house and several quick-change disguises is one of high-spirited, door-slamming farce, rather than L&H's characteristic low-keyed brand of comedy. Other Laurel & Hardy films might feature some lightning-paced farce, but such scenes usually have the boys reacting to actions and events beyond their control; in Another Fine Mess they are required to initiate the action, and they seem a bit tentative in this regard. Perhaps the three-reel length also makes the film seem a bit draggy and padded. Another Fine Mess is by no means a weak entry, and it is mostly solid in its execution. But the lack of memorable gags and routines render it a second tier Laurel & Hardy film: immensely enjoyable on the first few viewings, somewhat lacking and unsatisfying thereafter. If you've never seen it before, you'll probably love it. If you have, you'll probably rather watch Helpmates. JB: It's the little things in this film that remain funny on repeated viewings - Ollie playfully shoving Colonel Buckshot and then pushing him out the door violently; Stan yelling "Oh, Agnes! "; Ollie confusing Stan with the command "Let's reconnoiter." Toward the end, Stan has had to secretly change from maid to butler so many times that when Ollie says "Go get Hives", he begins to change before he even gets upstairs. But these moments are few and far between. There's nothing wrong with a Laurel and Hardy film based on typical farce situations. Chickens Come Home, another three-reeler with Finn and Thelma Todd, is one of my favorite Laurel and Hardy films. But that film is paced faster and has more action, as farce should have. In Another Fine Mess, Laurel and Hardy do an awful lot of standing around and talking with their guests, and very little scrambling around and panicking. The running gag of Stan changing costumes should have a big payoff, but it never comes. Ollie looking for the billiard room to show to Lord Plumtree has some amusing moments, but it is another gag that never really reaches a true climax. With all those doors Ollie keeps opening, their should be some surprise popping up behind one that causes commotion, but nothing ever does. And there is yet another running gag where Lord Plumtree keeps handing Stan and Ollie his card. It almost seems as if they tried to hold this film together with running gags. The bizarre chase ending comes off as a last-ditch attempt to liven up a slow-moving film. It is at least visually memorable, the one thing from Another Fine Mess that you will remember forever. 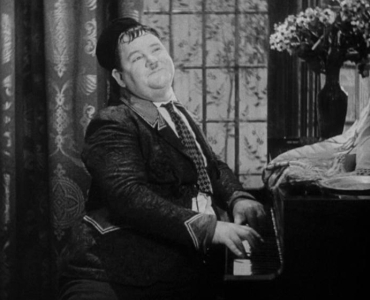 The score by LeRoy Shield is the first one he did for a Laurel and Hardy short, and includes the classic chase theme "Fliver Flops" as the boys make their bicycle getaway. If you are a baby boomer and grew up watching Laurel and Hardy and the Little Rascals on television, it is a piece of music that has probably been burned into your subconscious.